Gary McCurdy has earned the name ‘funeral man’ because he has presided over hundreds of funerals throughout the past 28 years. He is a minister at Lebanon Church of Christ at Knighton’s Crossroads and a realtor at Pope Realty in Piedmont. 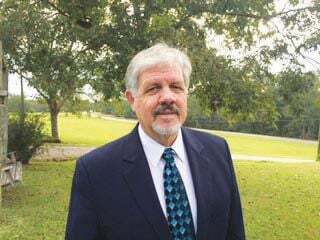 Gary McCurdy is the go-to preacher for Thompson Funeral Home of Piedmont. Owners Jim and Tammy Thompson refer those without a preacher to McCurdy, a minister at the Lebanon Church of Christ at Knighton’s Crossroads on County Road 6, just north of Piedmont. McCurdy now speaks at about 20 funerals a year, and often referrals come from people he does not know. The number of families that he has served is well over 400, considering that McCurdy has been a minister for 28 years, and taking away his first few years as a minister when his name was beginning to spread as a “funeral man,” which is what many people call him. His motivation? It’s not money. McCurdy donates any money that grieving families give him to his church, and the money is used only for benevolent purposes. “Sometimes we pay for people’s utilities or their transportation to the doctor or for medicine,” McCurdy said. How he came to be a minister in the first place is also a story. He met his future wife, Vickie Box, at Lebanon Church. Her grandfather, C.E. “Grandpa” Murphy, was the minister and had served there for 65 years. When he died, members asked McCurdy to fill in. “I have been filling in ever since,” he said. McCurdy retired from the timber industry at Kimberly Clark Corporation. Afterward, he became a realtor at Pope Realty, where he works now on a part-time basis. However, his “fill-in” job as minister takes up much of his time. He preaches to a congregation of about 80 members on Sunday mornings and nights, and he teaches class on Wednesday nights. His funeral ministry sometimes takes him all over the state and in Tennessee and Georgia; and he pays his own expenses. In addition to traveling for funerals, he and Vickie enjoy traveling, sometimes, to visit their son, Matthew, who is a physician in Bowling Green, Ky.
McCurdy’s philosophy about presiding over a funeral is to never preach any adult into heaven or hell. He meets the surviving family members and learns about the deceased person’s good traits. He emphasizes those during the funeral service. As with most preachers and funeral directors, he has also seen the ugly side of human behavior, funerals where law enforcement officers were present to keep peace, funerals of murder victims, and funerals that made him weep as he drove away – such as when young people die. Speaking at so many funerals has given him perspective.